Save 25% on Black Out Night and Krampus. 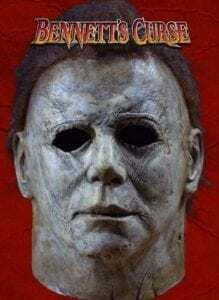 Enter to WIN A Mike Myers Mask for Halloween! See Special 25% Discount on Black out Night Discount Code: BLACKOUT and for Krampus discount code: KRAMPUS if you ORDER online NOW! See below how to enter to WIN a Mike Myers Mask for Halloween! Bennett’s Curse Haunted House is OPEN this weekend. Rain of Shine. All indoor haunted Houses including the waiting area. FREE Paved parking lot. No muddy shoes. Doors Open at 7pm. Buy your tickets online now or at the night of the event at the gate. Cash only at the gate ATM on-site. Click here to Enter to Win A 2018 Mike Myers Halloween Mask from Bennett’s Curse Haunted House! Entry form is also posted in the NEWS section of our website and pinned to the top of our facebook page. Enter our contest for your chance to win a 2018 Halloween Michael Myers Mask for the upcoming Halloween film exclusively signed by the owner of Bennett’s Curse Haunted House. Created straight from the movie molds, this is your chance to win a screen accurate collectible exclusively from Bennett’s Curse Haunted House! No purchase necessary.